April 5, 2018: Enough of you Winter.... I'm finished with you! Oh, look - a picture of my childhood! 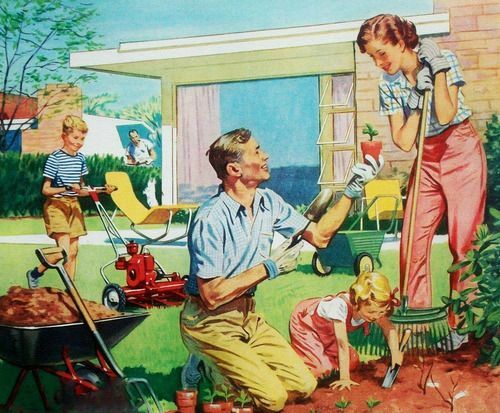 You had to mow the lawn as your family happily gardened and the weirdo neighbor spied on you? Doesn't that just give you a frisson of Mid-Century Modern? Ok, it's weird, usually the GTDS stream is louder then the mothership, but sometimes it is quieter. (it's nothing that needs adjustment, it's fine as is). It must be from the dj's end. @Jeff & Meghan: That was my childhood too (weirdo neighbor included). Yellow pants for the guys and pink pants for the ladies ... got it! I've noticed consistently low levels on the Drummer Stream. Never the reverse, though. I just flipped from Diane on my phone and noticed. Usually when I flip, I have to significantly lower the volume. (Bronwyn excepted, her level is always very low). Bon jour, Meghan, or is too late for that. That picture window is a bird-slayer, I bet. Wow, didn’t know Angelique Kidjo covered this! AWEsome. I usually use PC/Pop-up during the day, at the office, usually don't notice much volume difference from mothership and GTDR stream (I stream them both), but today it was very noticeable when I got to the GTDR stream the volume was really low, had to bring up the radio my PC is connected to. No big deal, but interesting. Omigod, she’s releasing in June the entire Remain in Light. I’m going to buy it stat. I like it Under here! @NGH - Has it been a harsh, cold winter in Florida? Have not seen any strawberries in the market for over a week now. They had posted a sign about severe weather influencing the fruit's availability. Industrial strawberries are sad, anyway. Like eating tennis balls. I've read they're one of the most pesticide-laden product items, too. That's sad cuz good strawberries are really, really good. Waiting for the spring has been a painful thing here. It teases with the weather and then boom, snow! Snow predicted for Saturday here too! recently moved to Dc. Produce seems much better here. However, that's not reason enough to migrate. In northern Michigan where the soil is — by typical farming standards — pretty poor, you can grow some beautiful berries. They seem to like the sand. They're red all the way through, dense, delicate, and sweet. Oh my. Even the regular grocer's organic section has been without them lately. I may check some organic stores next and see if they have any in stock. @Ken: It's been the coldest winter since 1989. Even our study sites in the Everglades suffered. I go in and out, did Meghan say Cecil Taylor is playing? thought that was what I heard, but I returned in the middle of the mike break. JJUUJJUU , not to be confused w/ Oneness w/ Juju. Awww, would love to see him again (saw him many years ago). I think he mostly recites poetry these days, at least that's the last I read about a concert of his. wow, and Stromae aren't even Cabo Verdean (judging by the lack of Portuguese). It's that young French woman, again! Sounded French, but w/ a smattering of Portuguese words thrown in there w/ a French accent. So, is the next song will be by Memphis? I was just listening to Jeff Buckley last week (listening to my cds abc, at Burkina Electric right now). "Jain was born on February 7, 1992 in Toulouse, France." been here since the Jeff Buckley only. glad i'm catching the reggae -for lunch. Well, that's the first time I've heard that! Thanks Meghan! ...actually, reggae once made my workplace disharmonious, believe it or not! a coworker behind my back complained to the owner that she's sick of all my reggae. Thanks Meghan! but i need more reggae; my lunch isn't over.